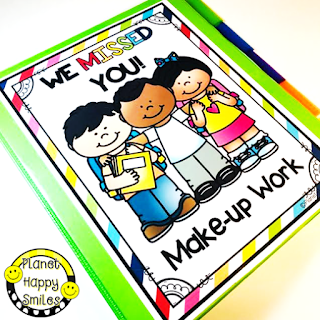 Planet Happy Smiles: How to Make Absent Student Paperwork Organized With Ease! How to Make Absent Student Paperwork Organized With Ease! It is that time of year when several of your students are getting sick. You have absent students and lots of papers to organize for them. We are going to show you variations of our system for making organization a snap for you and your students! Option #1: One way you can organize all of their papers is to have several identical folders prepared ahead of time. When a child is absent you simply place one on their table. You can have a helper place the items in the folder throughout the day. We have our “Table Captain” do this job. When the absent child returns, they will take it home or complete any activities that need to be done at school. Option #2: Another idea is to make one binder for the entire class that is kept in an accessible area. As papers are handed out, you simply write the absent child’s name at the top and put it in one of the pockets. You can have as many pockets as you feel necessary. I know I have had more than one out at a time. This will eliminate the need for multiple folders. You then staple all of the pages together with the note on the front. This idea works very well with papers that can not be sent home to complete. Option #3: You can also use hanging file folders in a plastic file tub. As students are absent, you can add the papers behind the student's name/number. 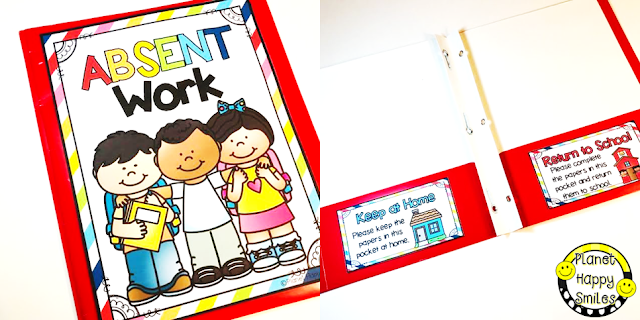 When the student returns, they can remove the items from their folder and take them home in the "Absent Work" folder. I will try and remember to take a picture of this one when I return this week. We hope this gives you some easy ideas of how to set one up! If you want to make it easier, grab our file and print and go!